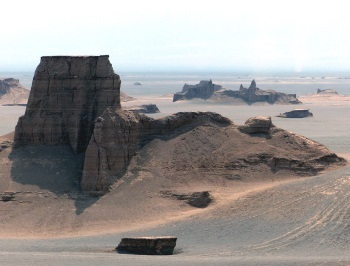 The Lut Desert in the southeast of Iran contains spectacular landforms shaped by wind erosion. There is a mix of high sand dunes and yardangs, mushroom rock-like features where the soft material has eroded from an originally flat surface and removed by the wind and the harder material remains. This salt desert also is known as the hottest place on earth: temperatures of over 70 degrees Celsius have been measured. The landscape is ‘hyper-arid’, seeing very little rain because it lies in a basin surrounded by mountains. Just visited - May 2017. Main question about this place is the limits of inscribed site. Dispite relatively huge area the place is not protected as a National Park or reserve, it is just a dessert. But while studying the official map on UNESCO website I am pretty sure that Nebkas area (just outside Shahdad) and Kaluts (some 40 km from Shahdad) are part of World Heritage. In fact on the right side of the road Kerman - Zabol, just outside Shahdad (around one km from the town) there is a small brown sign - Nominated Area, probably marking the limits of Lut Desert as a World Heritage Site. That should include Nebkas area as well. Further on, while you enter Kaluts, there is just a small sign although the road just crosses sandstone castles. Some practicalities: I read there is a public transport to Shahdad (but not to Kaluts) but the most convenient way is to rent a car (taxi) which I did. I took a car from Mahan to Shahdad than to Kaluts and return to Kerman for 1.200.000 Rial (including waiting time in the Kaluts area). It may take half to full day depending on the time you want to spend in Kaluts. I am pretty sure that similar can be organised from Kerman. Take plenty of water with you as it is the hottest place on earth, and something to cover a head. In fact descend from mountains to Shahdad was like going inside the furnace. It was even worse within Kaluts area. As Iran is no-shorts country it is good to have airy trousers. Within sandstone castles area (Kaluts) there are no marked trails so be aware where the car is parked. Two problems with trying to get “ahead of the game” by visiting T List sites before they are inscribed are that they might fail and also that any inscribed boundaries are as yet unknown/undetermined!! 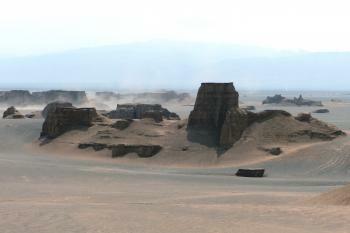 Iran has titled this site “Lut Desert (Vicinity of Shahdad)” and nominated it for consideration in 2016. Well, as the desert itself is 5400 km2 in area and is the 25th largest desert in the World (Wiki), I suppose we had to be thankful that we had been given some sort of starting point!! Shahdad lies around 95kms NE of Kerman and the entire trip by car into the Lut and back from Kerman took best part of an afternoon after seeing the fine Sufi shrine at nearby Mahan. The road was far better than I had expected from my map and it even cut through the mountains north of Kerman in a long tunnel before dropping down, down into the Lut at Shahdad. From there it wends its way for another c500kms across the desert to the town of Zabol on the Afghan border. Beyond Shahdad, ours was the only car but the well surfaced road carried a steady stream of lorries. 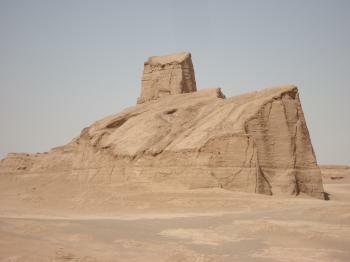 I tried to forget that Shahr-i-Sokhtar was only 50kms south of Zabol - just a day’s journey away. But, “there lies madness” when chasing WHS - there will always be another just beyond the planned route! Among the 4 “world records” claimed for Lut by Iran in its T List introduction is one that it contains “The hottest point of the world (based on the studies on the satellite images and data).” We didn’t have a thermometer with us and it was only the start of May but, on the few occasions that we left the car, the hot wind was stifling. Our driver even turned on the a/c without being asked - normally he did so with a pained expression and showed his dislike by donning a jacket against the cold! The T List description claims provide 2 more clues as to the likely inscribed area. a. “The longest widespread system of yardangs in the world (120 km long in 80 km wide)”. A few kms beyond Shahdad we came across a signpost stating “Nebka Park” in Farsi and English. And, soon after, another which stated in English - “Tal Gaz (Nebka). Eco-morphological phenomenon by wind erosion, especially sand created around the tree over time and become fixed. Plant life hills and hill dependent on each other. The dominant species in this area is Gaz. Sometimes length of this hills (Tel Gaz) reaches 12 metres which are the tallest of their kind in the world. The life and livelihood of the inhabitants of Lot is closely related to these hills” (sic). This latter sign looked reasonably new and was headed by a natty logo which turned out to be a stylised representation of a Yardang! Could this all be part of Iran’s “push” to get Lut inscribed? Around the sign were indeed sand “dunes” raised several metres above the stony, completely lifeless level ground and containing complete ecosystems of trees etc whose roots held the whole structure together against the forces of wind and possibly even occasional rain. We had successfully seen 1 of the 2 landforms we were looking for!! We drove onward for another 20 kms or so and the Nebkas disappeared to be replaced by eroded sandstone forms (photo). We had reached the area of Yardangs (or “Kaluts” as they are called locally). See https://en.wikipedia.org/wiki/Yardang . It also had a logo-marked sign – but only in Farsi. Whilst, to the untrained eye, one Nebka looks much like another and doesn’t actually encourage one to linger much beyond the time required to take a few photos, the Yardangs were well worth braving the heat for from a range of angles and locations – even to the extent of climbing a couple relatively close to the road. We did not however follow the 4 x 4 track across the sands in our saloon car! So, with both Nebkas and Yardangs successfully seen, we will be very disappointed if an inscription of Lut does NOT include the areas we had reached! But will these 2 geomorphological phenomena, neither of which is unique to Lut, plus Lut’s other merits (which include “In a major part of this desert, there is no animal and vegetable life of any kind.”!!) be enough to convince IUCN? Although the signs we saw contained a logo which could represent a National Park or similar I can find no evidence on the Web that the Lut has, so far, been gazetted as a legally constituted and recognised “Protected Area”. On the other hand Iran has recently had an excellent record of successful inscription of its nominations so it surely can’t have failed to cover this basic requirement? And that logo must represent some such entity? In a couple of months we will find out!